Note: Directors serve a 4-year term. Elections are normally held at the Annual Meeting in March. District 1 represents Colbert, Franklin, Lauderdale, Lawrence, Limestone, Marion and Winston counties and 47 Public Water Utilities. 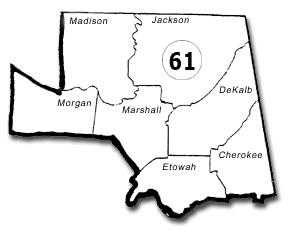 District 2 represents Madison, Jackson, Morgan, Marshall, DeKalb, Etowah, and Cherokee counties and 61 Public Water Utilities. Wayne Reed has been employed with the Northeast Morgan County Water & Sewer Authority in Sommerville, Alabama for 33 years and has served as the General Manager for the last 8 years. Wayne is an avid fisherman and owns and operates a cattle operation in Morgan County. He currently sits on Board of the Alabama State Products Mart Authority as well as the serving on the Board of Directors for the Morgan County Industrial Development Board. He is a member of the Society of Water Professionals and is currently serving as a Board Member of the Alabama Rural Water Association Board of Directors representing District 2. 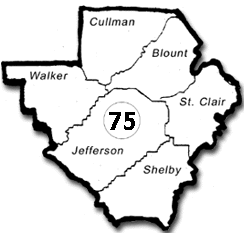 District 3 represents Cullman, Blount, Walker, Jefferson, St. Clair, and Shelby counties and 75 Public Water Utilities. Isaac Howard, III is currently the Mayor of Margaret and employed with Trussville Utilities. He serves on the Alabama Rural Water Association Board of Directors and he is a member of the Society of Water Professionals. Isaac has been employed by the City of Margaret for 19 years and has been employed with Trussville Utilities for 3 years. Isaac has been in the water and wastewater industry for 33 years. He has a Grade 1 Water and Wastewater Certification with Alabama Department Environmental Management. In addition, he is certified in cross-connection control, Hazmat A/O, and is a certified firefighter a first responder. District 4 represents Lamar, Fayette, Pickens, Tuscaloosa, Greene, Hale, and Sumter counties and 39 Public Water Utilities. Dennis Sudduth has served as General Manager for the Carroll’s Creek Water Authority in Tuscaloosa County, AL since 2007 and has over 40 years of experience in the water industry. Dennis is an Alabama Certified Water Operator. He has worked in Tuscaloosa as a fireman for 31 years and was also a cotton and soybean farmer for 21 years. He is a member of the Society of Water Professionals and is currently serving as a Board Member of the Alabama Rural Water Association Board of Directors representing District 4. 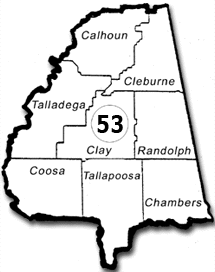 District 5 represents Calhoun, Cleburne, Talladega, Clay, Randolph, Coosa, Tallapoosa, and Chambers counties and 53 Public Water Utilities. For the past 14 years Echols Bryant has been involved with the Calhoun County Water Authority and also served during this time as the Chairman of the Board. Echols is currently serving as Vice President of the Alabama Rural Water Association Board of Directors. Echols has been a board member since 1997. He is a member of the Association's Executive Committee, By-Law Review Committee and Building Committee. 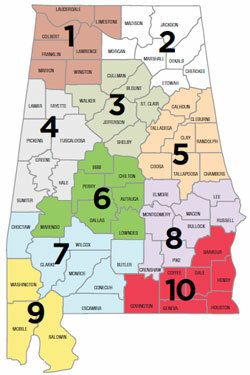 District 6 represents Autauga, Bibb, Chilton, Dallas, Lowndes, Marengo and Perry counties and 39 Public Water Utilities. 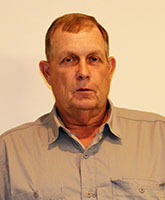 For over 20 years Terry Jackson has been employed by the Town of Thorsby Water Works Board. He holds a Grade 3 Water and Grade IC Wastewater. He is a member of the Society of Water Professionals. 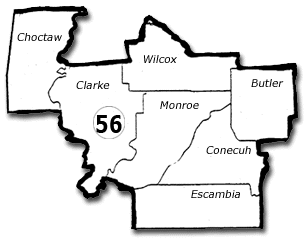 District 7 represents Butler, Choctwa, Clarke, Conecuh, Escambia, Monroe and Wilcox counties and 56 Public Water Utilities. William Snyder has been employed by the Monroeville Water Works since 1992. He holds the position of General Manager. William serves on the Alabama Rural Water Association Board of Directors as Secretary-Treasurer and is a member of the Executive Committee, Building Committee and the By-Law Review Committee. William is also the President of the Society of Water Professionals. 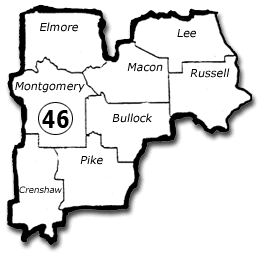 District 8 represents Elmore, Lee, Montgomery, Macon, Russell, Bullock, Pike, and Crenshaw counties and 46 Public Water Utilities. For over 43 years Randolph Hall has been employed with Dixie Electric Cooperative where he hold the position as Superintendent of the South Bullock County Water Authority. Randolph is currently serving as the President of the Alabama Rural Water Association Board of Directors, a position he has held since March of 1997. He is a member of the Association's Executive Committee, Finance Committee, Legislative Committee, By-Law Review Committee, and John A. Garrett Scholarship Fund. Randolph also represents the Alabama Rural Water Association on National Rural Water Association Board of Directors. 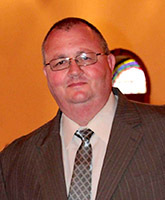 In addition, he serves as Secretary/Treasurer for the ARWA's John A. Garrett Scholarship Board. 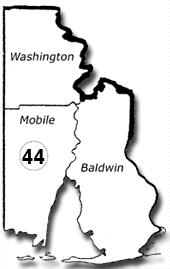 District 9 represents Washington, Mobile, and Baldwin counties and 44 Public Water Utilities. Mark Bohlin is the General Manager of Perdido Bay Water, Sewer and Fire Protection District in South Baldwin County Alabama. He has been serving in this position since 1998. As the General Manager of the Perdido Bay Water, Sewer and Fire Protection District Mark has set and achieved many innovative goals for the Water District. Some of these achievements include implementing a touch-read meter change-out program, GIS mapping of the Water District, hydraulic modeling of the Water District, modernizing financial, billing and collections software and procedures while integrating all of these areas of the operation of the water district so that they all work in conjunction with each other. Mark takes great pride in utilizing new and innovative technologies and techniques in the operation of the Water District. 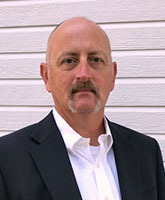 Mark is a Grade IV water operator with the State of Alabama and State Certified Electrician. He served four years in the United States Air Force as an Aerospace Ground Equipment Technician. Upon completion of his military career Mark worked as a Plant Electrician with Hunter Industries in San Marcos, Texas, served as Instrument Controls Technician with General Development Utilities in Palm Bay, Florida, and served as Operator/Manager of Hawk Pride Mountain Water System in Tuscumbia, Alabama. Mark has attended the Community College of the Air Force, University of Florida TREO Center, Troy State University and Columbia Southern University. Mark enjoys spending time with family, playing golf and traveling. Mark currently serves as a Board Member for the Alabama Rural Water Association Board of Directors and a Board Member for the Society of Water Professionals. He is a member of the Society of Water Professionals. 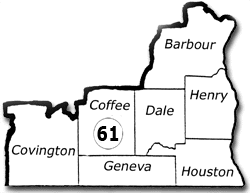 District 10 represents Barbour, Covington, Coffee, Dale, Henry, Geneva, and Houston counties and 61 Public Water Utilities. For over 30 years, James has been employed with the Geneva Water Works & Sewer Board. He has served as the Manager for the past 15 years. James holds a Grade 2 Water and Grade 3 Wastewater Operator License through the Alabama Department of Environmental Management. James is also a member of the Alabama Rural Water Association Board of Directors. He is a member of the Association's Finance Committee, Legislative Committee, Building Committee and By-Law Review Committee.